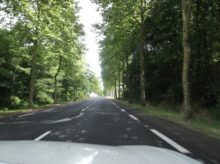 Inspiring you to make the most of every day Driving to the Loire Valley. An Excerpt from Clancy Goes to France. Driving to the Loire Valley was a pleasure, despite being somewhat fatigued from a sleepless night on the ferry. Today, I thought I’d try something different so I’m going to share a little snippet from the book to give you a glimpse inside my writing world. This excerpt is from our first day driving to the Loire Valley on our 2013 Europe road trip. We arrived in St Malo and travelled down to Onzain, a beautiful drive if you take the time to enjoy it. It’s short but brings back vivid memories of stunning country views, sunflower filled fields and a feeling of anticipation and nerves of what lay ahead. The undulating forest green of the rolling, wooded hills gives way to vast plains. We drive for miles without seeing a soul, only the odd house sitting lonely on the horizon and the occasional level crossing with grasses waving their willowy heads between the railway tracks. My tiredness at this point is getting quite significant as is my headache but I feel that we are in touching distance, so I decide not to stop. I know that I need to turn right at some point to head down to Onzain, and when I pass a tiny lane I realise very quickly that the village of Herbault where I was going to turn off is little more than a few houses. I turn around and take the lane with no signpost, and it’s got to be worth a punt – I need to go south and the sun tells me this road goes south, easy! Driving down this twisty lane into the unknown, I feel quite confident that we are in the right place and sure enough after about five minutes we arrive in Onzain – only to be greeted by local gendarmerie (police). Isn’t it funny how even when you haven’t done anything wrong, an officer of the law can make you feel like you have! If you’d like to read more please sign up for our newsletter or purchase Clancy Goes to France at all major outlets. Profits from the book are donated to the MS Society.